Pregnancy Week 19: Have heartburn? Eat healthy snacks! You are already half way through your pregnancy. Book a table at your favorite restaurant to celebrate! You may have noticed lately that you have increased heartburn every so often. It is unpleasant but harmless and very normal. This is also due to the effect of the hormone progesterone on your body. It has weakened your intestines and therefore also the opening of the throat to the stomach. Because the stomach muscle is weaker, the stomach acid can come up more easily. Your baby is now so big that they put pressure on your stomach. You can reduce the amount of gastric acid coming up by making sure you always have food in your stomach. When your stomach is empty you have a greater chance of regurgitating the gastric acid. Pick healthy and low-fat snacks. 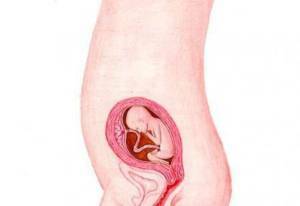 If you fill up on fatty foods for the rest of your pregnancy you will have quite a few excess pounds to shed afterwards! Carrots, cucumber, and other raw vegetables are perfect snacks.